The passion of a great dentist is the oral health of his or her patients. Preventive and restorative dental treatments care for the important basics of tooth and gum health while cosmetic dentistry keeps smile aesthetics bright and beautiful. How exactly do Dr. Jaclyn Jensen and Dr. Tiara Applequist, cosmetic dentists in Warren, accomplish this? Learn about this interesting and imaginative specialty and what you should look for in a cosmetic dentist. As with any dental treatments, you deserve superior skills and individualized patient care–not some cookie-cutter approach. The dedicated team at Renu Dental is very patient-centered, possessing the right listening attitude to understand an individual’s smile goals and the right technological skills to transform them into a complimentary look. 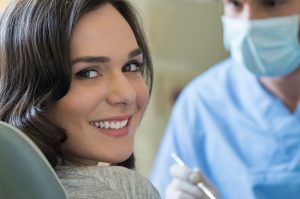 Every cosmetic dentistry patient should check his or her dentist’s educational credentials, professional memberships (the American Academy of Cosmetic Dentistry is an important one) and patient gallery of before and after photos. Check out the reviews section of the Renu Dental website for what patients are saying about their oral health care experiences. Your dentist in Warren should offer a wide array of cosmetic dental treatments, implementing just one or combination of services into a smile makeover just right for the individual’s age, gender, smile width and facial features. At-home professional teeth whitening using concentrated hydrogen peroxide gel applied with custom-made acrylic trays. Whitening is safe for healthy teeth and gums and lifts out stains from dark foods and beverages, smoking and the aging process. Direct bonding, or composite resin bonding, uses a tooth-colored combination of glass and acrylic to reshape and repair smile gaps, chips, hairline fractures and surface defects. The dentist also uses composite resin for life-like, tooth-colored cavity repair. Tooth contouring reshapes and evens tooth length and shape. Crown lengthening exposes more tooth surface and eliminates that “gummy smile” look. BOTOX injections erase fine facial lines at key dynamic wrinkling sites at the brow, sides of the mouth and other areas. You can enjoy a beautifully refurbished smile from the best cosmetic dentists in the Warren area. Contact Renu Dental to pursue your personalized treatment plan today. We know you’ll find superior care and the best patient-doctor relationship for your healthiest, brightest smiles ever.